Original, quality, Fry's Chocolate tin issued to "Commemorate the opening of the Royal Edward Dock in Bristol" on "July 9th 1908". 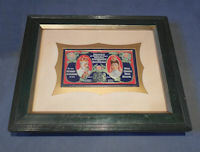 In mint condition and in the original mount and green finished plaster on wood glazed frame. The tin is highly coloured and detailed with cameos of King Edward VII and Queen Alexandra and the mount is in scribed pen script "Presented to Joseph Naish 1908". We have re-papered the backboard and tightened up the tin mount and now all is complete and in good order. Truely in remarkable condition. Tin 5.75" x 3.25", outer frame 12.25" x 10.25" and 1.5" front to back. 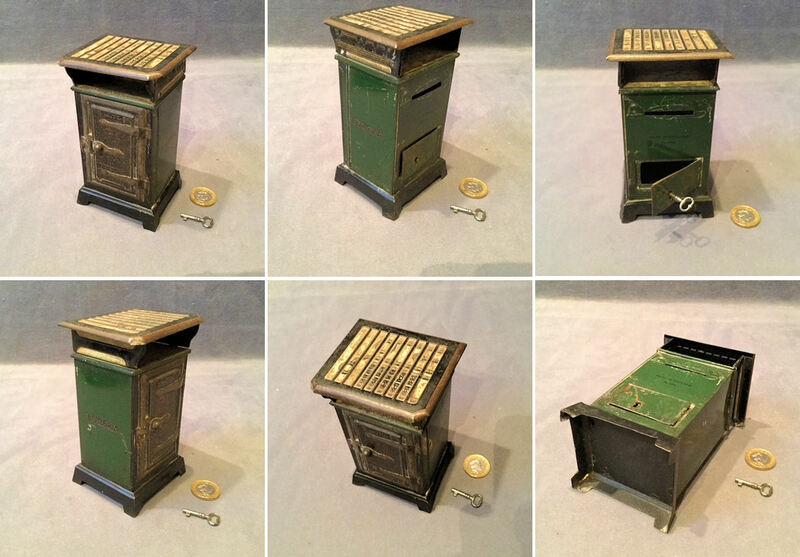 Original, quality pre-war tin money box, in the form of a miniature gas stove in the original detailed paintwork with a key. The sides are both transfer decorated with "Eureka" the reverse "Made in England No555", the front, a simulated oven door and the top, the gas rings and grill. "Eureka, No 410" is also detailed to the door and is probably the model of the gas cooker represented. Some minor scratches to the finish otherwise complete and in good and working order. 5.5" tall x 3" x 2.75" front to back. 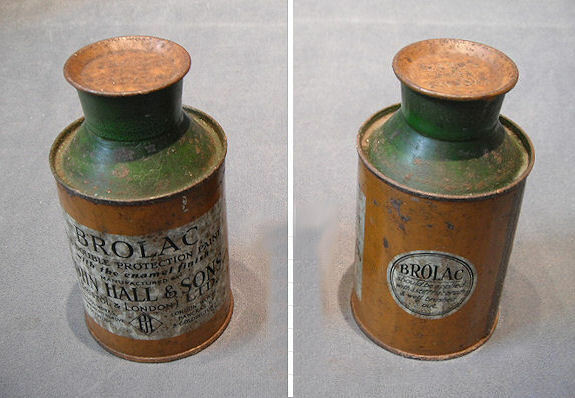 Original, quality, pre-war, tin of "Brolac" paint, un-opened, with contents and labels to the outside. The tin has most of the original outer pale brown paint to the body and cap and green to the shoulders and neck. In super condition. 5" tall x 2.75" diameter. 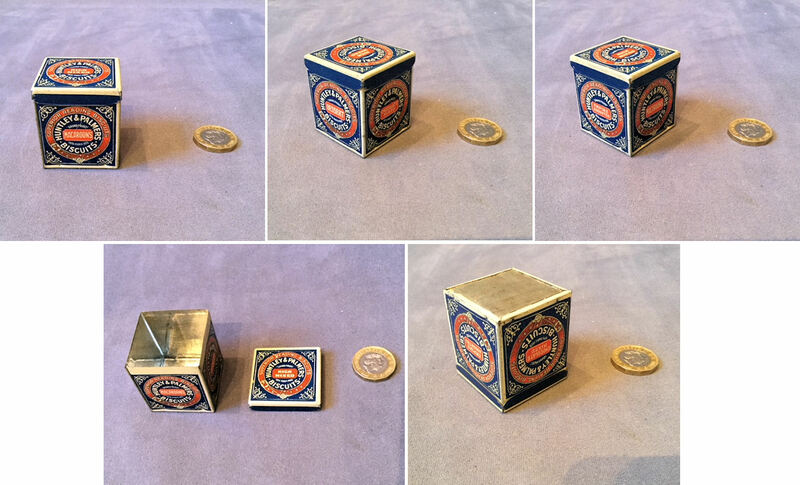 Original, quality, miniature Huntley and Palmer's cube shaped biscuit tin in mint condition, circa 1900 / 1920's. This example originally contained tiny biscuits in the form of letters spelling out "Huntley and Palmers". 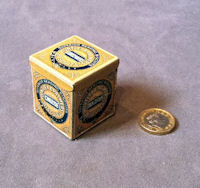 Several models of this shape and size were issued and this one is decorated with blue on white with each panel detailing "Superior Reading Biscuits, Huntley and Palmers" with a different biscuit of their range "Rich Mixed", "Macaroons", "Dessert, "Empire Assorted" and "Chocolate Mixed". In near mint condition. Complete and in good order. 1.5" square and 1.75" tall. 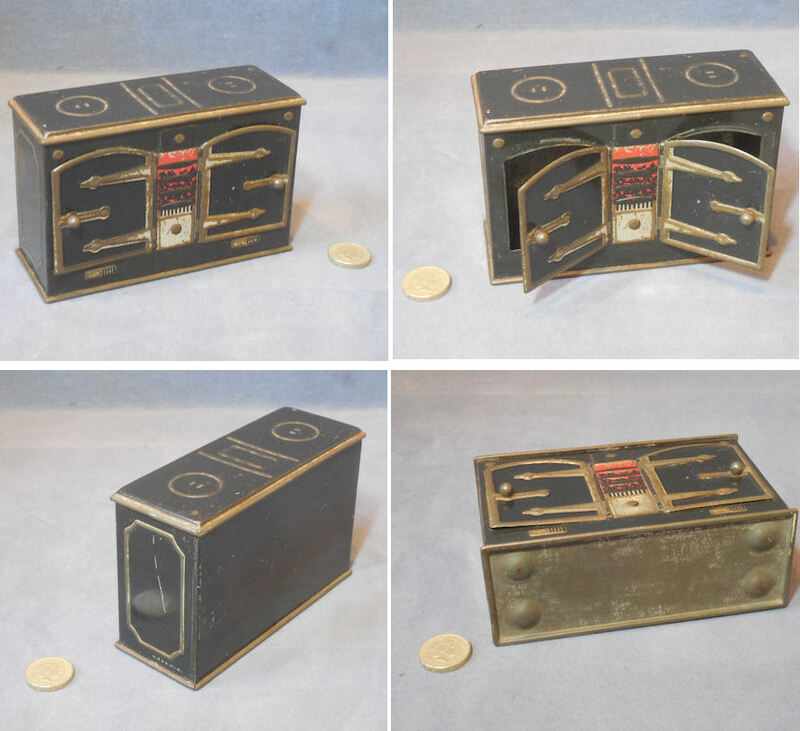 Original, quality, miniature Huntley and Palmer's cube shaped biscuit tin in superb condition, circa 1900 / 1920's. This example originally contained biscuits in the form of letters spelling out "Huntley and Palmers". Several models of this shape and size were issued and this one is decorated in white and red on dark blue with each panel detailing "Superior Reading Biscuits, Huntley and Palmers" with a different biscuit from their range "Nice", "Cornish Wafer", "Iced Gems", "Osborne" and "Petit Beurre". In near mint condition. Complete and in good order. 1.5" square and 1.75" tall. Price is for each. 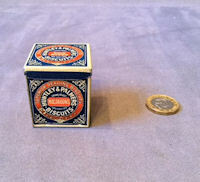 Original, quality pre-war 1lb of tobacco size tobacco tin in amazing condition. 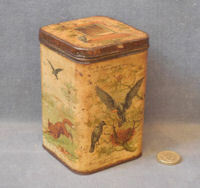 This example has a coloured picture on both sides of the hinged lid, with the title "Redbreast Flake" and a robin on a branch in the snow. 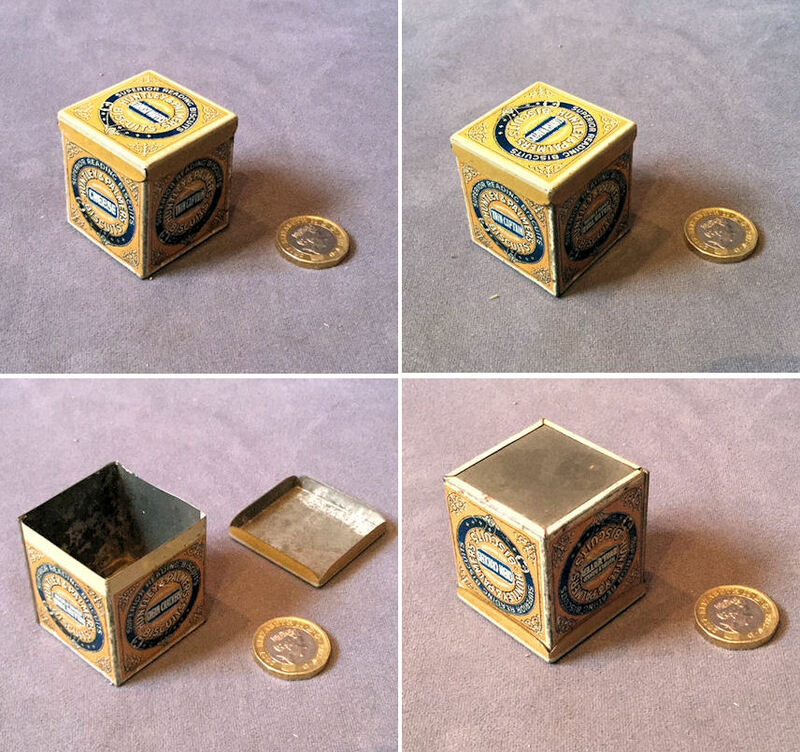 The rest of the tin is in good order with the original gilded finish. Not a common tin. 6.5" x 4.75" x 1.25". 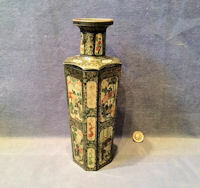 Original, quality Huntley and Palmers biscuit tin in the form of a Chinese vase. This example was issued in 1928. 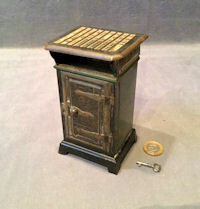 The lid lifts off from just above the shoulders and the underside is detailed for "Huntley & Palmers Biscuits Reading and London". All is in super condition and complete. 10.25" tall and 3.25" widest. 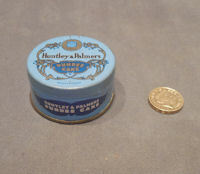 Original, quality miniature Huntley and Palmers cube shaped biscuit tin issued in 1926. This example originally contained small biscuits spelling out "Huntley & Palmers". Several models were issued and this one is decorated in a buff colour and marked for "Cornish Wafers", "Cream Crackers" "Cheese", "Thin Captain" and Highly Baked oval water" . In super condition and complete 1.5" x 1.5" and 1.75" tall. 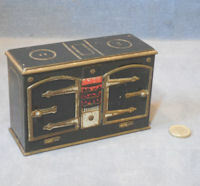 Original, quality Huntley and Palmer biscuit tin issued in 1926 and entitled "Kitchen Range". This super tin is difficult to find in good condition today for when found the doors or catches are missing. 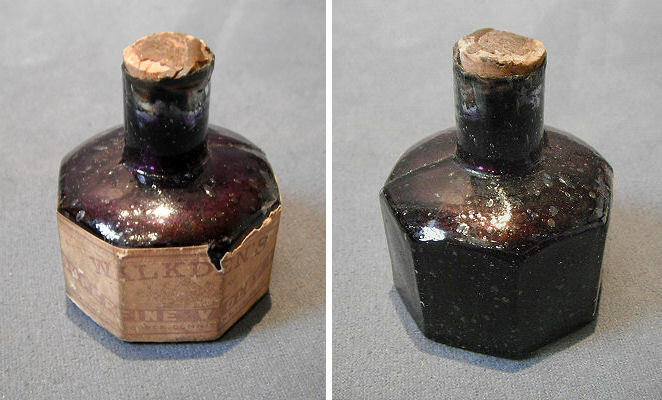 The original paint on this example is generally in good condition as is the tin with just the minor rubbing and one scratch. The doors are hinged, and the latches do operate. The underside is etched "Huntley and Palmers biscuits Reading and London", and one end is printed 'HB and S Ltd R' for the manufacturer of the tin Huntley Bourne and Stevens Ltd. Cleaned and waxed and complete and in good order. 5.5" x 2" x 3.5" tall. Original, quality 1920's square biscuit tin etched to the underside "Carr and Co Biscuit manufacturer Carlisle". This super example has pictures to all sides and top, with a continuous story of the crow with the cheese and a fox. The tin is in good condition and the pictures are all intact albeit a little faded. 4.75" tall and 3" square. 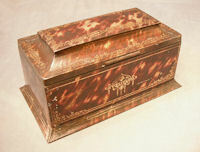 Original, quality, Huntley and Palmer biscuit tin issued in 1927, made to resemble a sandlewood casket. This tin is embossed with frieze designs of Indian elephants, the tin has a hinged lid with a push button and a catch to the front. The underside is etched "Huntley and Palmers Reading and London". Generally in good order and complete with some rubbing but no dents or damage. 10" x 7" and 4.25". Original, quality 1920's, tall cylindrical tin with a circular press in lid. 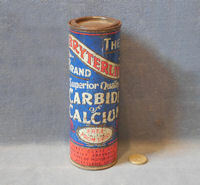 This tin details "The Bryterlite Brand Superior Quality Carbide of Calcium". 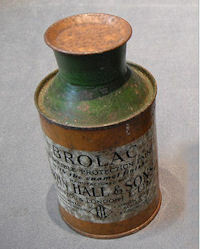 1lb size prepared by "The Humber Oil Company Ltd" and "Specially Prepared For All Types of Motor and Cycle Acetylene Lamps". Lots of other details and some rubbing overall but no dents or rust and no contents. 6.75" tall x 2.25" diameter. 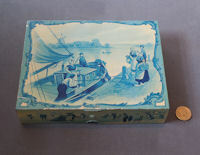 Original, quality, rectangular shaped biscuit tin with Dutch scenes to the lid and four sides in shades of blue. 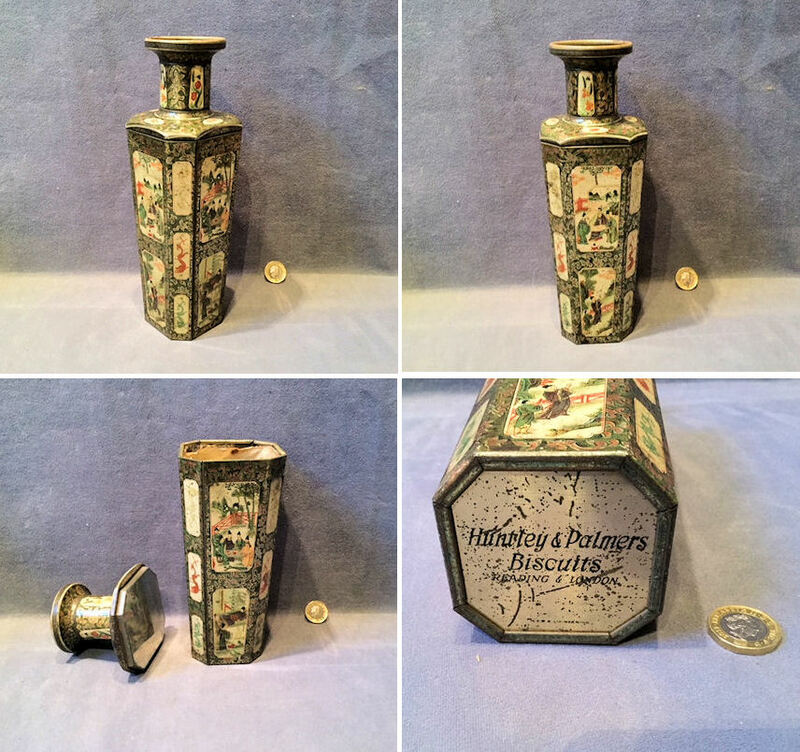 This tin was produced for Huntley and Palmers in 1897 and is referred to as the 'Delft' pattern. The underside is impressed "Huntley and Palmers Biscuit Manufacturer Reading and London". A very clean example of an uncommon tin with just a few minor rubs and scuffs. Complete and in good and order. 8" x 6" and 1.75". Original, quality 1930's, miniature biscuit tin detailed to the sides and lid for "Huntley and Palmers Dundee Cake" in Royal blue on pale blue. Originally supplied with a mini cake and probably given away at exhibitions ? Some minor rubbing, otherwise complete and in good order. 2.25" diameter x 1.25" tall. 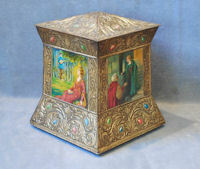 Original, quality, very decorative biscuit tin in the form of a casket decorated with jewels and with four coloured pictorial panels. 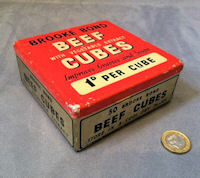 This tin has four bun feet to the underside and a square lift of lid to the top. The underside of the lid is detailed "John Buchanan and Bros Ltd, Stewart St, Coweaddens, Glasgow" the manufacturer of the original contents. 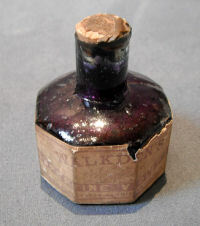 The lid is also stamped with the registration number for the year 1913. Some rubbing to the relief, but overall a good clean tin, complete and in super condition. Base 6.75" square, total height 8.5". 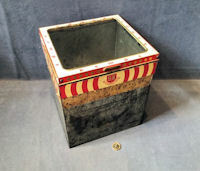 Original, quality 1920's, biscuit tin in the form of a tortoiseshell jewellery casket, with a shaped plinth to the base, a hinged lid and a secret hinged panel to the very top. This example is in good condition overall, with the odd minor dent and scratch to the printed detail. 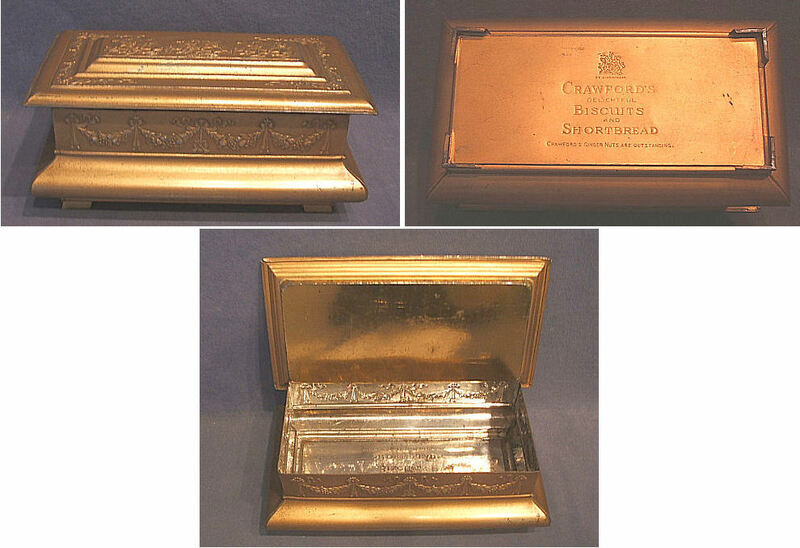 The underside is detailed "William Crawford and Sons Ltd, Biscuit Manufacturer, Edinburgh, Liverpool and London, Great Britain." Base 8.5" x 4.75", total height 4.25". 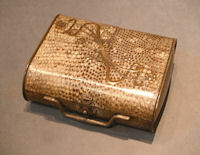 Original, quality, superb Huntley and Palmer's 'Wallet' biscuit tin in the form of a snakeskin handbag. This tin was manufactured in1903 by Huntley Bourne and Stevens for Huntley and Palmers and is in super condition retaining its original handle and catch, with just a few minor rubs and scratches around the catch area. Complete and in good order. 7.25" x 6" and 2.75". 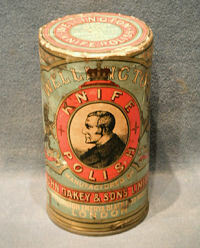 This tin was purchased at one of ITV's "Dickinson's Real Deal" filming days at Harrogate. Original, quality, biscuit tin in the form of a log box, issued by 'Jacobs Biscuit Company' in 1929 and entitled "Jacobean Log Box". 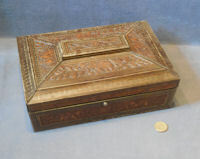 The sides of this tin are embossed to simulate carved wood panels and the lid has a thin sheet of embossed brass applied. The underside is printed "Jacob and Co Biscuits" and the brass top is embossed with a woodland scene of a father returning home with the dogs and the morning bag of rabbits. Most of the original paintwork remains and the brass has been polished and lacquered, although the lacquer may be removed at no extra cost. A super tin in pretty good order and complete. 7.4" x 4.3" x 3.9". 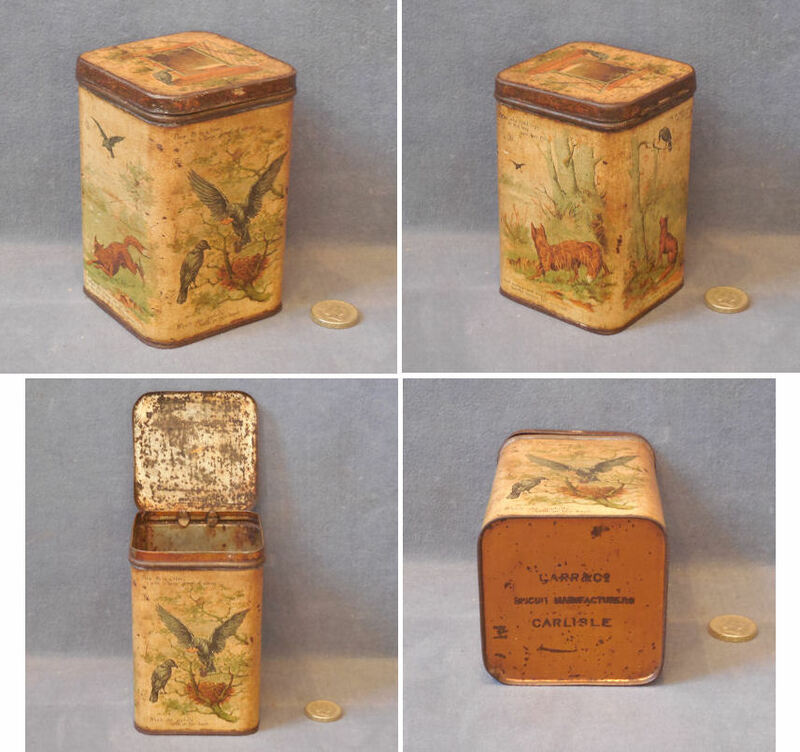 Original, quality, post-war, miniature square biscuit tin, originally filled with small biscuits and probably issued as a promotional item. 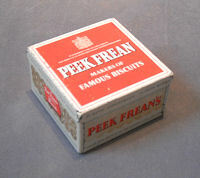 Printed in red and silver on grey and detailing "Peek Frean Makers of Famous Biscuits" and "By Appointment To The Late King George VI". Not in mint condition, but very, very clean. Complete and in good order. 3.25" square and 1.75" tall. 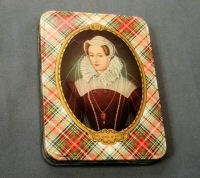 Original, quality, pre-war, flat, biscuit tin printed in colour to the lid with a cameo of Mary Queen of Scots, on a tartan design covering the lid and sides. Detailed to the reverse 'Macfarlane Lang & Co Biscuits' for the manufacturer of the original contents. Some minor scratches, but otherwise in good order. 8.5" x 6.25" x 1". Original, quality, 1920/30's, casket shaped gold coloured biscuit tin with designs in relief, of swags to the sides and Grecian type horsemen to the top. Impressed to the underside for the contents, 'Crawford's Delightful Biscuits & Shortbread', and, 'Crawford's Gingernuts Are Outstanding' all under the Royal Appointment coat of arms. Some rubbing to the high points and some very, very minor dents, otherwise complete and in good order. 8.6" x 4.7" x 1.5". Original, quality 1920's / 30's, sealed packet of "Day and Sons Red Drink" in the original pink paper wrapping detailed with the manufacturer "Day and Sons", "Instructions For Use" and "By Appointment of H.M. The King" this would be King George V or VI. Complete and in superb order. 6.5" x 1.75" and 1.75".